Spider bites: When should I seek medical attention? Fear of spiders is one of humanity’s most common phobias, but of the nearly 900 species of spiders in Texas, only two are considered poisonous to humans. This means most spider bites aren’t worth panicking over, but bites from black widow spiders and brown recluse spiders – the most dangerous of Texas’ arachnids – require immediate medical attention. Portable toilets, abandoned sheds, wood piles, cellars and other undisturbed places can all be homes to black widow spiders. Only female black widows are poisonous, but the pain from a bite won’t be significant early on. In fact, it’s possible you won’t even feel the initial bite of a black widow, but the pain – usually focused in the abdomen and back – may increase in intensity within one to three hours and continue up to 48 hours. Tremors, nausea, vomiting, leg cramps, loss of muscle tone and increased blood pressure are also among the symptoms patients may experience. Small children, the elderly and people with health problems are most at risk of experiencing serious complications from a black widow bite. Few cases have been fatal, but patients should be taken to an emergency room to get an antivenom. It is the only shiny black spider. It has a red hourglass pattern on its abdomen. Female adults average 1 ½ inches long; adult males are much smaller. They typically hang upside down in their webs to reveal their hourglass marking. Brown recluse spiders tend to be most active during the night and hide during the day. You’ll often find them living in dry places like barns and closets, according to Texas A&M’s AgriLife Extension Service. Like black widows, brown recluse spiders aren’t aggressive. 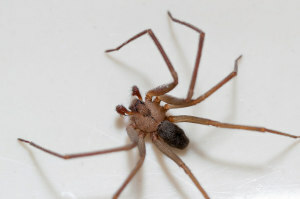 Because of their nighttime activity, brown recluse bites sometimes occur when people roll over one in bed. Or if a piece of clothing is hanging in a closet for a long period of time, a bite may happen when that clothing is pulled out of the closet. Shake out shoes, clothes and towels that have been stored for a long period of time. Though a bite from a brown recluse might be painless initially, it can become more painful in the next two to eight hours. Victims of a brown recluse bite might experience chills, nausea, weakness or joint pain within 24 to 36 hours. The severity of a bite can depend on the area of the body bitten, the amount of venom injected and whether the victim is a child or elderly person. They are light brown to dark brown in color. They’re about the size of a quarter. Brown recluse spiders have six eyes arranged in pairs. Adults have a dark, violin-shaped mark. They have no spines on their legs. For most spider bites, apply an ice pack to relieve swelling and pain; but if the reaction is severe, consider visiting an emergency room like the Elite Care Emergency Room in San Antonio’s North Central neighborhood. You can also find the Elite Care emergency room nearest you by viewing all of our Elite Care locations.